This buttermilk huckleberry cake was as good as it looks, and I have Heidi Swanson of 101 Cookbooks to thank for that. 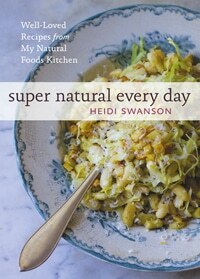 Heidi is not your typical vegetarian, and her latest cookbook, Super Natural Every Day, is not your typical vegetarian cooking. Yeah, I know, I am a hunter. I eat meat. A lot. But I like my fruits and veggies, too. I first became aware of Heidi early on in my blogging career, when her stuff would show up in Google searches for the various odd ingredients I like to use: farro, whole oat groats, quinces, black kale, wild mushrooms. Her dishes have always been well-thought out, original, and tasty. Heidi’s latest book is doing very well, and I suspect it is in part because people are looking for that originality — you just don’t see taste combinations like hers very often: She makes a fantastic oatcake that is pretty normal, until you get to the coconut oil. You don’t think it’s going to work. It seems too weird. A Scottish oatcake should not have tropical ingredients in it. Yet, somehow, it does work. None of Heidi’s dishes are bound by tradition. And there’s something more. My one strike on her cooking is that she uses a lot of tofu and tempeh and other hippie-vegetarian stuff in place of meat. I get it: She’s a vegetarian. But for those of us who like our meat, all it takes to make her dishes wonderful is to add a little chicken or pheasant or whatever. Lose the tempeh on Heidi’s black pepper tempeh and sub in wild turkey breast (or yes, domestic turkey breast, too) and the dish is a knockout. Many of her vegetarian dishes don’t need meat — a curried farro soup is among them — but adding just a little bit of crispy bacon brings it up even more. My point here is that Heidi’s book can be a template for healthy omnivorism: Her dishes lend themselves to adding just a touch of meat here and there, almost as a garnish. And this, to me, is probably how we ought to eat anyway. Meat is good, but do we really need to be eating more than a half-pound a day, as the average American does? Probably not. The other place where Heidi’s cooking shines is in her desserts. I really, really don’t like overly sweet desserts. And neither does she. Her buttermilk cake is a triumph — mildly sweet, tangy and tart from the fruit toppings. Plus, it will keep at room temperature for 4 days, covered loosely. Big bonus, considering that Holly and I can only eat so much cake at a sitting. This is not the exact recipe for Heidi Swanson's buttermilk cake, although it's pretty close. Heidi uses plums and turbinado sugar on her cake, while I am using huckleberries (blueberries would be fine, too), mixing them into the batter, and then topping the cake with maple sugar. This cake is super moist, delicately sweet and it keeps for several days. It's a little like a giant blueberry muffin. Preheat the oven to 400 degrees and make sure you have a rack near the top of the oven. Heat rises, remember? 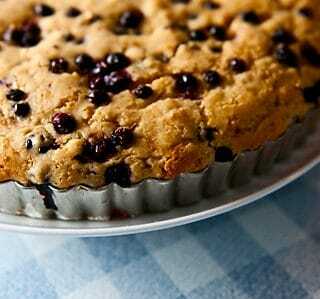 Butter and flour an 11-inch tart pan with removable bottom or a 9x13 cake pan and set aside. Mix the flour, baking powder, salt and sugar in a large bowl. In another bowl, whisk together the buttermilk and eggs. Now, with one hand whisking the mixture, drizzle in the melted butter. You need to do this to keep the heat of the butter from scrambling the eggs. Pour the wet ingredients into the dry ones, and mix just to combine. About halfway through the mixing, add the lemon zest and 1/2 cup of the huckleberries. 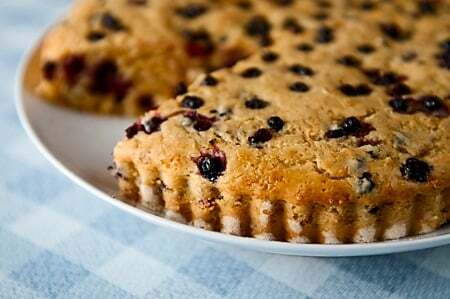 Pour the batter into the tart pan and make sure it's evenly distributed. 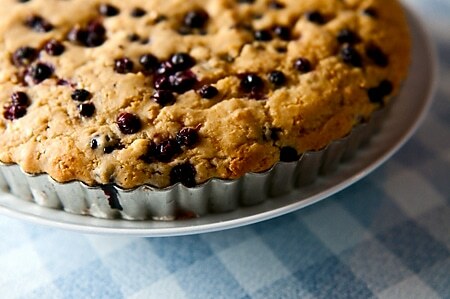 Sprinkle the remaining huckleberries over the cake, then the maple sugar. Bake for 20-25 minutes, or until a toothpick comes clean out of the center of the cake. Gently remove the tart pan from the oven and set on a rack. Let this sit 5 minutes, then, very gently, pop the bottom up from the pan to free the cake, which will look like a large, flat muffin. If it sticks on the sides of the pan, use a knife to free the cake. Let the cake rest on the rack for 15-20 minutes before eating. I should be searching for dinner ideas, but my sweet-tooth always derails those plans. Love this cake. It sounds a lot like my almond-berry cake. I have to see what this is all about. Luckily, I have some berries in the fridge and freezer!